Working your way through this pertinent material will leave you with a solid, well-rounded Excel foundation. If you’re an absolute beginner, you’re not quite ready for Excel School. If you’re John Walkenbach (or could write your own Excel Bible), you’ve probably mastered most of the content already. If you’re somewhere in the middle, there’s lots to learn in Excel School, including Advanced Charting, Conditional Formatting, Advanced Formulas, Macros and Pivot Tables. I have viewed several of the Excel School videos and have found that Purna covers the topics in detail and his lessons very clear and easy to understand. Is Excel School for you? I don’t know…but if you are someone who is willing to invest a little money for the much greater return of increased productivity (and all the benefits that come from it), I think it’s worth checking out. I am very happy to hear what these highly knowledgeable people think of Excel School. Thank you. I have decided to add 12 more hours to excel school registration deadline. So you should be able to join until 12 noon on 22nd June, Pacific Day Time (find out what time it is now). Comeback on Wednesday, I will have some juicy excel stuff waiting for you. Hi, I need to join that, and would be able to do that once I reach home. Do you think, you could hold on the closure until then....please? Thanks a ton and god bless you. "Any intelligent fool can make things bigger and more complex... It takes a touch of genius - and a lot of courage to move in the opposite direction. 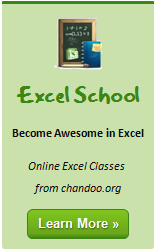 Chandoo has done just that with Excel School. I haven't seen such genious since Rutherford split the atom. And you can quote me on that". @Jeff... did I appear too marketingy with this post? No, I don't think so at all. I was just having some fun, not critisising you, hence the 🙂 face. @Jeff... you are not a random dude 😀 You care a lot about this community and what we have here. So I respect your opinion much more than that of a random dude's. I think all members of this forum fully appreciate you genuine "awesomeness". We also realise the balancing act you perform in order to fund your enterprise, in return giving so much back to us. keep up all your great work. But I like snake oil. More to the point, so does my snake. Keeps her from squeaking. * An advertisement or campaign that uses a more direct, forceful, and overt sales message. Turns out you've very bad at hard sell, and you're going to have to work a lot, lot harder to meet those definitions! You're not shy on making a sales pitch, but that's how you make your living. It would be remiss of you to not ask for custom...that's the job of an entrepreneur. Your pitch has no pressure, and there's genuine reviews from people in the know. You give pages and pages of free (and valuable) content away for every word of any sales pitch you make. And the way you've set up this community is very transparent, by virtue of the comments box like this one under each of your posts. If you don't deliver on that sell, you'll pay. Not that my words mean anything. It's your blog. It's your brand. @Chrsitian & Vipul.. Thank you. Just so you know, Jeff is being sarcastic and sincere in his posts. Hi Guy's sup Jeff. Fancy meeting you here! I've just registered on the VBA class and am really looking forward to recieving the contents. I'll feedback with my opinions as the course progresses. Bring on the awesomeness !